Wait, you are reviewing a budget bundled headset? Contrary to what you have been led to believe not all bundled smartphone headsets are Junk. 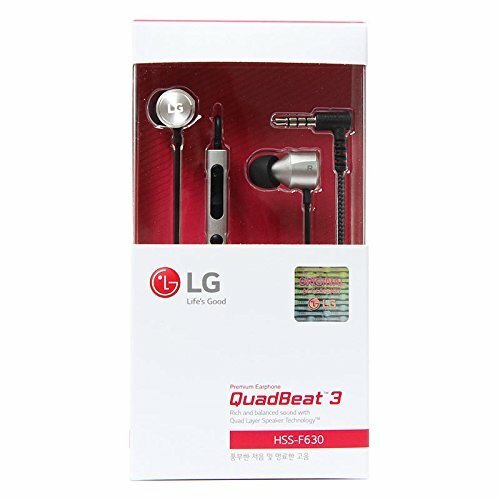 For a few years now LG with its Quadbeat line of earphones has been bucking the trend. The In-Ear headphones which usually come bundled with some high-end LG smartphones such as the G4 and G5 are also available to buy at the uber low price of $20. When people first asked me to take a look at the LG Quadbeat 3 (which are tuned by AKG) I wasn't really up for it. Despite the excellent Sony MH1C, included earphones have always been a major let down. However. you kept asking for a review. Over and over on twitter and Facebook. So here it is. Are they really a top budget earphone or just more trash destined for the landfill? Well, my set were donated to me from someone who had received them with an LG G4 Smartphone so there really isn't much to talk about. I have seen the retail packaging and its pretty low quality generic packaging with some extra earphone tips included in various sizes. Of course packaging means very little and at the end of the day these earphones cost under $20 so what do you really expect. You know for $20 these are actually pretty nice. I have the red version for review and they look very much like a cooler styled set of JVC-FX101. The housings for the dynamic drivers are small cylindrical with a good length on the nozzles to allow for a perfect insertion depth. Each earphone has a metal LG faceplate and has adequate strain relief where they attach to the cable. The cable itself is pretty cool with the lower half being a braided cord and the top smooth rubber. I found it to be very tangle resistant and low on microphonics. There is a small more split but nothing in the way of a slider due to the inclusion of the inline microphone / remote. Buttons have a solid click and you get the usual option to play/pause, answer/disconnect track skip, and volume up and down. Inline call quality with the Quadbeat connected was excellent and our voices were heard loud and clear. The end of the cable is terminated with a 3.5mm right angle jack with good strain relief. While there is nothing too fancy about the LG Quadbeat 3 from a design standpoint the are a very good looking headset that functions well and is better made than a lot of other in-ear headphones under $50. Sound Quality - They shouldn't sound this good...but they do! Ok, let's keep things in perspective. The Quadbeats aren't going to beat out $100 plus IEM's anytime soon. However, they really do punch well above their weight and they are a super fun sounding headphone for the price. Bass extends deep but remains tight and punchy making it work wonders for electronic music, hip-hop, and pop. The remain composed and controlled yet have the ability to unleash hell in certain tracks and are more than capable enough to get your head bouncing. Mids are smooth and clear with a fair amount of detail that I wasn't expecting as well as enough warmth to make me. Soundstage is not huge but it is in no way something that would put me off buying the Quadbeat's. Treble is laid back and smooth but surprisingly had a fair amount of extension. This is something where a lot of sub $50 earphones fall down on but the QB3 sounds great right across the spectrum. As mentioned they work well with most modern genres but really excel at the modern ones. They are way more refined than I thought they would be and other than the MH1c there is very little in the way of competition for them. Truly one of the best value finds of 2016. The Quadbeat 3 have really impressed me over this week-long review. Not only are they a good looking headset but they also live up to and exceed the performance of their predecessors. For the current asking price, there is very little that can compete with them and for that reason, we have now included them on our list of the best earphones under $50.